Having already spent a day and a half driving, somewhat incredibly, I was still in Western Australia. Driving across the Nullarbor (and even just out of WA, it seems) is no mean feat. The distances involved are not to be underestimated. Neither is the amount of wildlife propagating the popular Australian myth that all the animals are out to get you. This post details the second day of the two-day journey across the Nullarbor. To read about Day One click here. Otherwise, keep reading for tales of oysters, whales, wombats and sand dunes! Eucla is only just within WA; it is 12km from the state border with South Australia. It is probably about as far from its state capital as it is possible to be. In fact it is closer to SA’s capital Adelaide, than Perth, WA! It didn’t take long to reach Border Village. Somewhat strangely, the area between Border Village and Ceduna seems to be a bit of a no man’s land, in terms of interstate quarantine rules. Travellers heading west are questioned and/or inspected by quarantine officers at the border, but travelling east nobody is interested in checking for illicit fruit and vegetables until you reach Ceduna. Clearly anything goes on the Nullarbor! Consequentially travellers heading east are welcomed into South Australia by Rooey II, the large kangaroo outside Border Village Roadhouse and fuel station, and not by chaps asking if you are carrying a fridge. Despite the name, Border Village is simply a roadhouse and fuel station by the border. Don't get excited; there is no village. The first sights in South Australia were arguably the most impressive. There are four sign-posted lookouts after Border Village, each offering spectacular views over the dramatic Bunda Cliffs as they drop about 100m into the Great Southern Ocean. The Nullarbor Plain is a limestone plateau that was once under sea. The view at each lookout is different so it is definitely worth a quick stop at each lookout as you pass. 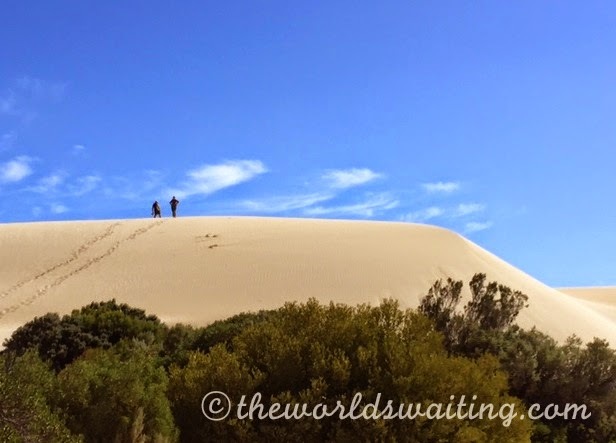 Having left Border Village, you quickly come onto the Treeless Plain, along which none of the desert scrub grows more than about half a metre off the ground. You can see a long way in each direction, across miles of what looks like empty bush, which is clearly a deception. This is one place where you will see the well-known massive warning signs about camels, wombats and kangaroos. The Nullarbor Roadhouse was a welcome sight as I was starting to get low on fuel (they also have a shop and offer accommodation). The other publicly accessible Murrawijinie cave is around 10km drive north of the Nullarbor Roadhouse. Around 90km further north is the now ghost town of Cook. Cook is on the Transcontinental Railway and on the longest stretch of straight railway line in the world (478km). Shortly after leaving the Nullarbor Roadhouse, you come to the Head of the Bight, which is the large northernmost bay on the Great Australian Bight. Huge numbers of whales visit each year in July to give birth and they can be seen frolicking in the water with their calves until around September. There wasn’t a hint of a whale when I was there (February) but it was still lovely to walk along the cliff edges on the viewing platforms taking in the views. The entry fee is $7, which is about as inexpensive as whale watching comes, if you’re there at the right time of year! Past Nundroo a detour takes you to Fowlers Bay. The sleepy little settlement sits between some enormous sand dunes and the ocean. There is a jetty if you fancy another ocean stroll, or you can burn some energy scrabbling up a sand dune. Two gravel roads link Fowlers Bay to the highway. The western road surface seemed in better nick than the eastern road which was heavily corrugated. About 190km east of Nundroo, and 25km before reaching Penong, I happened upon Scotdesco. Scotdesco (Tjilkaba) is a small Aboriginal community that welcomes visitors, who can learn about the area from the Aboriginal perspective. 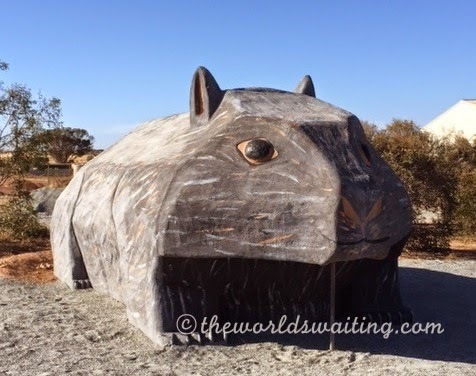 Visitors can check out the art workshop, meet local artists and admire the big wombat, in the heart of wombat country. Check out the little wombats on top of the gateposts too, cute! I arrived at Ceduna at what I thought was late afternoon, but what the locals (2.5 hours ahead) considered early evening. Following a quarantine inspection, I spotted the Oyster Shack just a few hundred metres past the border. I'm not an oyster fan but if you are get there before the border closes at 19:30! 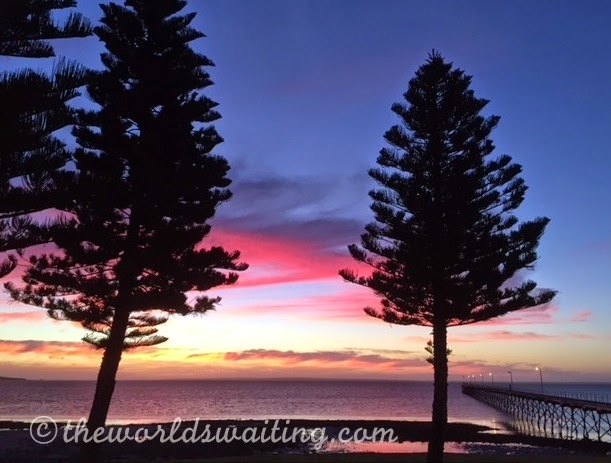 Dinner and a spectacular sunset later, I had crossed the Nullarbor! The first day, from Norseman to Eucla, took roughly seven hours of driving (highway driving, mostly at 110km/h) plus a bit of time to eat along the way. Day two took roughly five and a half hours (again, highway driving). 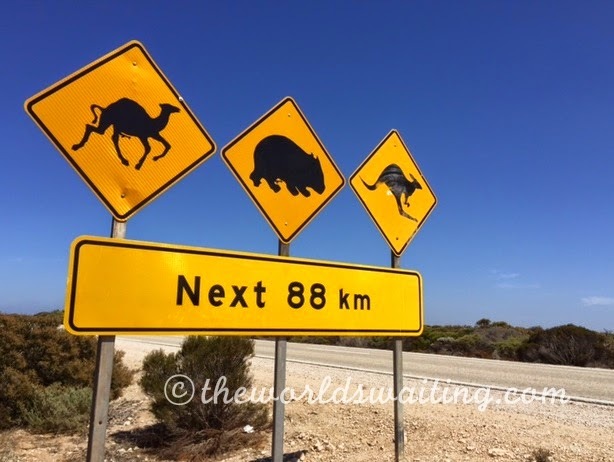 It would be possible to do the whole drive in one day, but it would be essential to leave Norseman early, say around 5am, as judging by the amount of roadkill, especially at the western end of the Nullarbor, the wildlife poses a significant risk to traffic (and, sadly, to itself). However, crossing the Nullarbor in a single day leaves no time to enjoy the sights and truly experience the Nullarbor. I’d recommend allowing two – three days to drive across at your own pace and allow time to explore along the way. Despite seeming desolate and empty, there is a surprising amount of things to see along the Nullarbor! 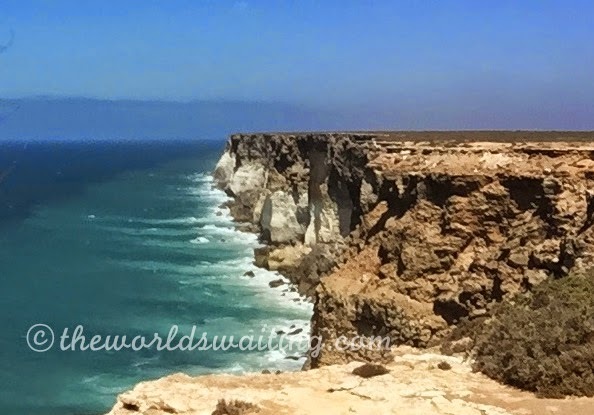 Have you crossed the Nullarbor? If so, are there any other sights you’d recommend people take in along the journey? Please share them in the comments below.